In September 1881 the SS Cape Clear was completed at the R. Steel and Company shipyard at Greenock, Scotland (just north of Glasgow). The new iron hulled ship was 89 metres long and 12 metres wide. It displaced 2,439 tons and was originally a pure cargo vessel. It was powered by a two cylinder steam engine made by R. Steele and Company which drove a single screw giving it a maximum speed of 11 knots. The ship was constructed for Abram Lyle and Sons of Greenock. Its first use was transporting migrants to Tasmania from Europe. On 25 August 1883 she left Plymouth in England and sailed to Australia carrying 372 emigrants, arriving at Hobart, Tasmania on Friday 26 October 1883 (or perhaps 25 October). As the ship approached Hobart (off Goose Island), the engine broke a piston and it nearly ran aground. There were a few cases of scarlet fever among the passengers during the journey. A photograph/etching in the State Library of NSW (see photo at right) shows the Cape Clear at port in Hobart in 1883, probably on the trip referred to above. This was the first direct steamer to run from England to Tasmania. In either September or November 1884 it was purchased by the Union Steam Ship Company of New Zealand for £36,500 (one source says £34,000) and renamed SS Tekapo. 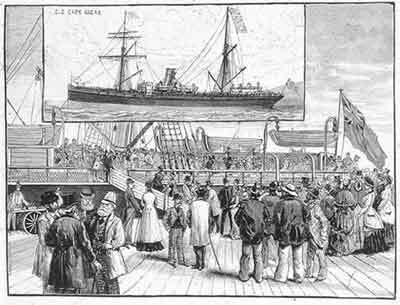 It is more likely it was September as the ship arrived in Adelaide in late November 1884 (see below). After the purchase the Tekapo was modifed by Denny and Brothers of Dumbarton (another small town just north of Glasgow in Scotland - a very nice little place). After the modification, the ship carried cargo as well as passengers. You can see that the photo below of the Tekapo shows some differences from the Cape Clear. These are primarily a taller and skinnier funnel and the addition of what is probably the passenger accommodation behind the bridge. The Tekapo could carry 133 passengers, 82 in Saloon Class and 51 in Steerage. In its day it was one of the bigger ships operating in the Australian region. On Thursday 29 November 1884 the Tekapo arrived in Adelaide from Western Australia with 312 passengers on board. About 100 of the passengers went to the Marine Board and lodged a complaint about the dirty conditions on board the ship. It does not appear much came of this complaint. After purchase it appears that the Tekapo was utilised on the NZ to Australia run. However, on 18 April 1885 it arrived in Fremantle from Bunbury from Melbourne and Adelaide. I am not sure if this was an isolated voyage. It could be that its run was from NZ to Melbourne to Fremantle (Perth's port). On Wednesday 14 April 1886 the Tekapo arrived in Hobart from New Zealand. It was reported that she had just undergone an extensive overhaul, with the replacement of the large piston, a rebore of this cylinder, the boilers cleaned and much more. She left for Melbourne the same day. In October 1887 it sailed from Lyttelton (Christchurch, NZ) for Calcutta, India. The Tekapo made two more voyages to Calcutta in June and September 1888, each time carrying about 250 horses for the British Army. On the return trip, the ship brought back thousands of bales of woolpacks and cornsacks for the New Zealand agriculture industry as well as castor oil, tea and other merchandise. On the return trips she was to stop at Adelade and Melbourne. This was more profitable than the forward trip. On 27 August 1888 she stopped at Hobart for coal. It appears she may have run much further south and missed at least Melbourne as she had come around the south-western corner of Tasmania. The skipper was Captain John Anderson. In between these trips to the sub-continent, the Tekapo continued on the Trans Tasman run. It appears that the Tekapo was also used for some time on the Launceston to Sydney run, bringing Tasmanian produce back to Sydney and also on the Sydney to the South Seas run. In preparation for the 1889 Centennial Exhibition held in Sydney, the Union Steam Ship Company had all their larger passenger steamers refitted in anticipation of an upsurge in business. The SS Tekapo was the last to be worked on and accommodation for an additional 50 passengers was installed. The photo at left may have been after this work was done. On Thursday 19 December 1889 the Tekapo arrived in Hobart from New Zealand. She had just completed a three week periodical overhaul. While this was been done, she had an extra dining saloon and sleeping berths for 96 passengers installed. I am not sure if this was in addiiton to the 50 above or the same work. The space where the new dining saloon and berths were placed was formerly used for cargo. The new saloon was in the centre of the vessel, and was said to be "of a thoroughly substantial character and quite up to the standard of excellence maintained by the Union Co. All the furniture and equipments both in the new saloon and sleep lug berths are of New Zealand manufacture". The overhaul included the painting of everything and an overhaul of the boilers and engine. The ship sailed for Melbourne on the same day. She was to leave Melbounr on 24 December 1889 and arrive back in Hobart on 26 December 1889. On the evening of Friday 18 April 1890, a labourer employed on board the Tekapo at the Queen's Wharf , William Wales, was engaged in unloading the vessel. He missed his footing and fell into the hold. This was about nine metres. When picked up he was unconscious. He was taken to the Melbourne Hospital. It was not reported what happened to him. 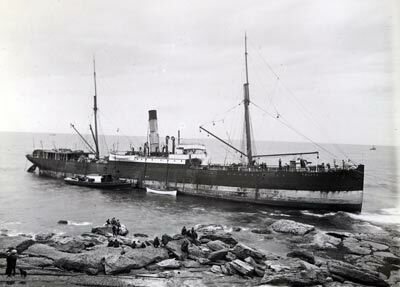 On Friday 29 January 1892, the Tekapo ran aground on Stoney Point in Newcastle Harbour. Anyway, she was refloated without damage on Saturday 30 January 1892. In mid-1894 the ship would appear to have been still being used on the Australian/New Zealand to India run as on 10 May 1894 she arrived in Albany, Perth after travelling from Adelaide, South Australia. 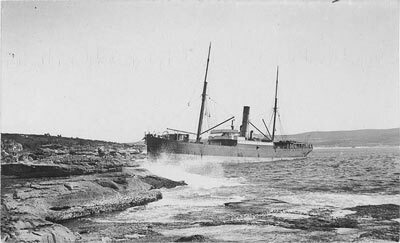 On the night of Friday 15 June 1894 the Tekapo was forced back to Albany in WA by huge seas. She was on her way to Fremantle. On Saturday 1 December 1894 the Tekapo arrived in Melbourne from Western Australia. Alexander Hell, the ship's carpenter, reported to the police that soon after the arrival of the ship at the Australian Wharf, a purse containing 16 sovereigns was stolen from his bunk. On 18 March 1895 she arrived in Albany from Fremantle and the next day departed for Vasse (this is west of Busselton, WA - this is what the paper reported but I did not know there was a port there). 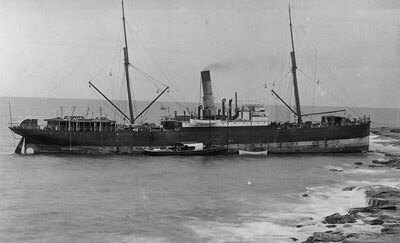 On Thursday 8 October 1896 the Tekapo was leaving Newcastle Harbour for Sydney and then New Zealand when she had to take steps to permit room for the incoming vessel SS Baron Cawder to safely enter the harbour. The tide caught hold of the Tekapo and she hit the Government dredger Poseidon. The Tekapo had a hole knocked in her bow and she had to go back into port for repairs. In April 1897 Captain Herbert Sams was appointed the skipper of the Tekapo. It seems that a lot of her trips for this period were to and from Launceston in Tasmania. On Sunday 2 April 1899 the Tekapo arrived in Sydney from Launceston with a team of Tasmanian lawn bowlers. The Tekapo arrived in Sydney Harbour from Launceston on 13 May 1899. 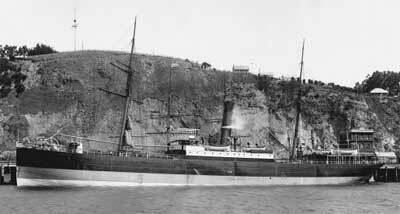 At 2.30 am on Tuesday 16 May 1899 the Tekapo left Sydney Harbour under the command of Captain Herbert Sams for Port Kembla (just south of Sydney) where it was to take on coal to replenish its bunkers before returning to Sydney for another trip to New Zealand. Fog settled over the coast and the course set should have let the ship sail safely to Port Kembla. The fog got worse (why is it that having lived almost all my life in the Eastern Suburbs, I have never once seen fog that even went a dozen metres off the coast??) so Captain Sams kept to half speed. Crew were stationed forward as lookouts. It is stated that the fog was so bad the bridge could not even see the foremast. Why the Captain did not hove to in such conditions is one of those questions that will never be known. The Tekapo did not get far, only 14 kilometres from Sydney Harbour, when she came to grief on the southern headland of Maroubra Beach. The vessel bumped twice amidships and lifted onto flat rocks off the main rock platform. The bow smashed heavily against a wall of rock. The time was 3.45 am. A check of the engine room showed no water so Captain Sams ordered the ship to be placed in full reverse. Nothing happened. Rockets and distress guns were fired but South Head lighthouse saw and heard nothing. Residents of Randwick, Coogee, Rockdale and along the Cooks River heard the signals (obviously considering the fog, they saw nothing) and reported it to the authorities. Captain Sams then ordered the lifeboats to be launched as the fog prevented the crew from seeing that they were actually right on the shore. The first boat ran onto rocks almost straight away. It took two hours for the ship to be located and the boat under the command of Second Officer, Mr Fisk, did not reach the Coogee Bay Hotel until 7am (Maroubra was still not settled). At 9 am the pilot vessel Captain Cook and the tug Vigilant started on their way to Maroubra Beach. Together with the tugs Fearless, Newborough and Greyhound were not able to move the ship an inch. Plates were opened up by hitting the rocks and water was in the forward hold. The swells were moving the wreck, lifting her up and dropping her on the rocks. Three tugs remained on location but stood out to sea during the night of 16 May 1899. By the next morning the vessel was further up the platform. Divers reported that the hull was holed in the ballast tanks and bow. Meanwhile, salvage work went on and everything possible was removed and put on the tugs. As attempts to refloat the Tekapo failed, the Union Steamship Co. submitted the hulk to the insurance company. Salvage went on till Friday 19 May when the hull was sold for £380, to, of all people, the Union Steamship Co. The seas had been very calm since the 17 May 1899 and the ship had not suffered any more damage so it was still thought possible to refloat the ship. On Monday 22 May 1899, the seas picked up dramatically and the Tekapo was hit by the swells. However, little additional damage was caused. 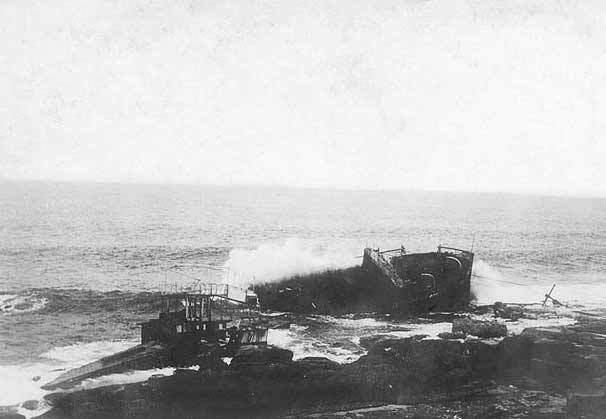 The Union Steamship Co. had by now sold the wreck to Mr Mountenay (who had also purchased the Hereward just year and a few days earlier - located less than 2000 metres to the north on North Maroubra Beach). His intention was to take the wreck apart piece by piece. Wednesday 24 May 1899 was the Queen's Birthday Holiday and the residents of Sydney came in their tens of thousands to see the wreck. This was a forerunner of activities to come just over 30 years later when hundreds of thousands trekked out to Malabar and La Perouse to see the wrecks of MV Malabar and SS Minmi respectively. The people caught trams to Coogee and either walked or came by coach and bike to the southern end of Maroubra Beach. Some people walked nine miles from the city along Bunnerong Road. The last report of the Tekapo wreck was on 31 May 1899 when it was reported that the ship had broken into three pieces but "There is...a prospect of good salvage". The engine, dynamo and fittings were apparently removed. As usual, a Marine Board of Inquiry was held and on 12 June 1899 it found that the wrecking of the Tekapo was caused by the wrongful act or default of Captain Herbert Sams by navigating too close to the shore and setting a course that set the ship on shore during fog. Captain Sams' Foreign Going Masters Certificate was suspended for six months from the date of the wreck. 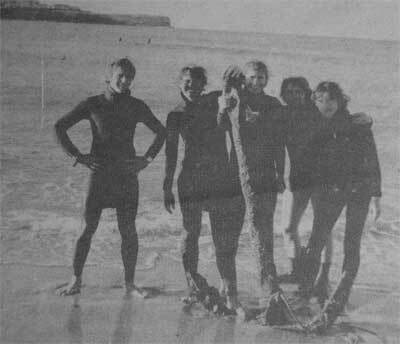 A few days before 4 October 1972, a group of young divers led by Noel Hitchins, then of Maroubra and later the founder and long time owner of South West Rocks Dive Centre, salvaged two anchors and some lead and brass fittings from South Maroubra. Noel (who died in early 2005) was a good friend of mine and another of the group was Phil Short, another good friend and someone who I have dived with regularly since the early 1990s. They thought at the time that these were from the wreck of the sailing ship Hereward which sank on Maroubra Beach during the "Maitland" storm on Thursday 7 May 1898 and this is what was reported in the local paper. However, there is the possibility that these are actually from the wreck of the TSS Belbowrie which is also wrecked at South Maroubra (see later). 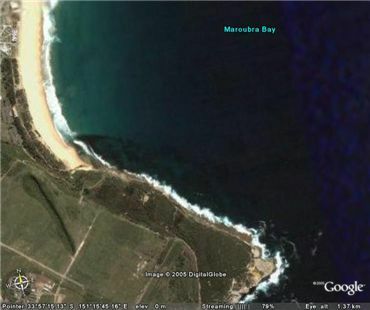 During some discussions with Phil after Noel's death, I thought that the anchors probably came from the Tekapo as they were salvaged from Magic Point, the south-westernmost point of South Maroubra (see the satellite photo above). Phil reports that they attached a 44 gallon (200 litre) drum to the anchors and filled them with air. The drum and anchor came free from the sand and launched itself into the air once it surfaced. 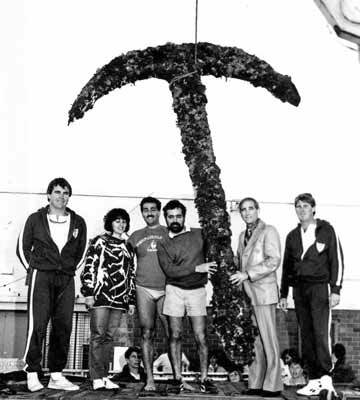 On 22 June 1986, another anchor of the Tekapo was raised by Maroubra diver Greg Tannos and some other divers and taken to Rose Bay by boat. 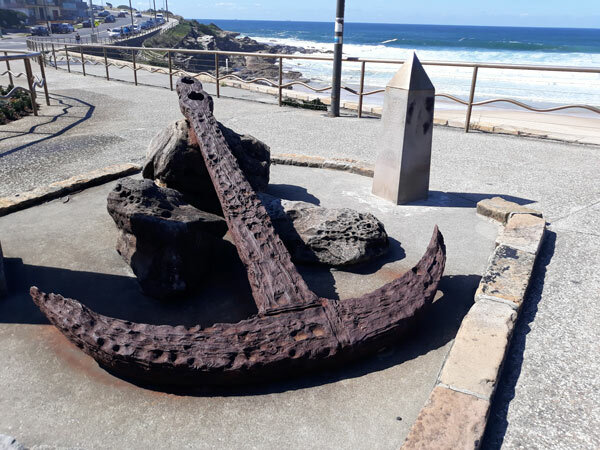 The anchor was then treated and then installed adjacent to the Maroubra Surf Life Saving Club as part of a monument to the Tekapo. 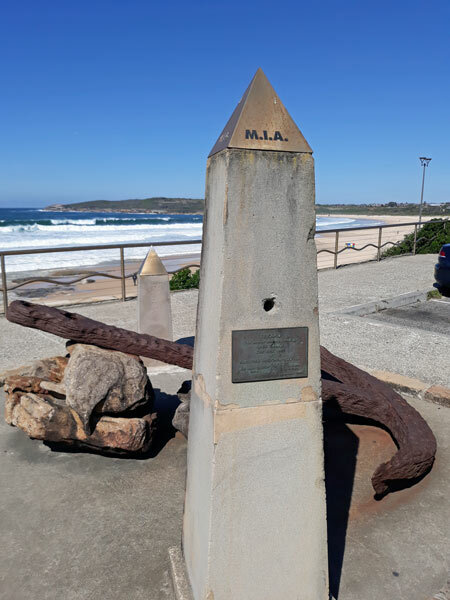 At some time in the 2010s, the monument and anchor was moved to North Maroubra Beach. You can use the monument (two obelisks) to find the wreck's location. 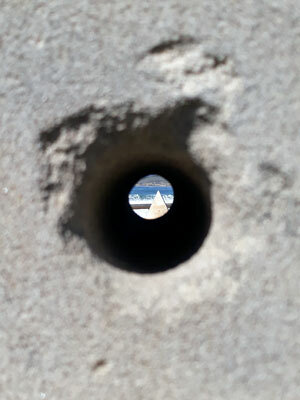 If you look through a hole in the larger obelisk and line it up with the top of the smaller one, you will see where the Tekapo was wrecked at South Maroubra. 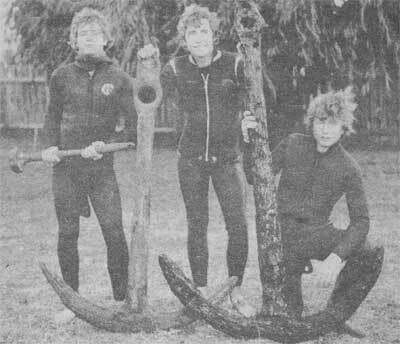 However, having finally found a photograph of this in October 2016, I believe that the two anchors raised by Noel and Phil back in 1972 may have in fact been from the SS Belbowrie which sank closer to the beach and was a lot, lot smaller (see the difference in size of the three anchors). To date I have not found any part of the wreck that would confirm it as coming from the Tekapo. There is some wreckage about 200 metres out from the sand of South Maroubra Beach in five metres of water. This could be from the Tekapo or from the TSS Belbowrie which was wrecked not too far away on 16 January 1939. 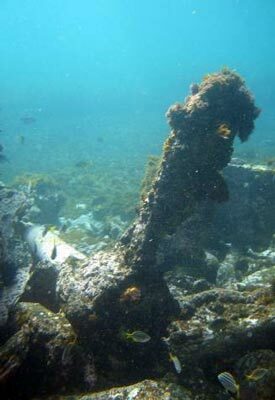 The wreckage here includes some bollards, iron or steel plates (possibly confirming this as the Tekapo as the Belbowrie was a timber vessel) as well as a smallish winch. I have also searched out towards the far point (Magic Point) using a scooter but have not found a single piece of wreckage. Considering the size of the Tekapo, there must be a considerable amount of the wreck somewhere here as the boiler and prop would not have rusted away. As mentioned above, the engine was reported to have been salvaged in 1899. In May 2007 Herb Kollman sent me a photo of a propeller and a section of prop shaft. He says that this is located near Magic Point. From the look of it, I think that it is probably from the Tekapo as it is fairly large. If anyone has any more information on the exact location of the main part of the wreck, I would be happy to hear from them. The Messenger 4 October 1972, page 19 and page?